IFA: Sony adds Portable Ultra Short Throw Projector to Life Space UX series | What Hi-Fi? 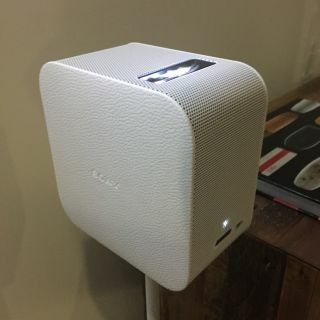 Sony's new Portable Ultra Short Throw projector can produce a 50in image when placed just centimetres away from a wall. We saw an Ultra Short Throw projector from Sony at CES 2014, which was able to produce a 4K image, up 147-inch in size, from just 28 inches away from the wall. This new Portable Ultra Short Throw model can produce an image between 20 and 50in in size from a compact body that's just 10 cubic centimetres. Sony says that due to its diminutive size, it can be set up anywhere in a room, such as on a table or against a wall. And thanks to a Symphonic Light Speaker, the whole room is not only filled with light, but also "crystal clear sound". And now, thanks to the size, you can take it with you, whether it be on holiday, or round to a friend's house. It certainly seems like a product with serious bragging potential. This new projector is the latest addition to Sony’s Life Space UX series of products, which aims to reimagine the ways in which “users interact with their living spaces". The Portable Ultra Short Throw projector is due for release in Spring 2016, prices are yet to be confirmed.